Principal Cast : Pierce Brosnan, Jonathan Pryce, Michelle Yeoh, Teri Hatcher, Gotz Otto, Ricky Jay, Joe Don Baker, Judi Dench, Vincent Schiavelli, Desmond Llewellyn, Samantha Bond, Geoffrey Palmer, Colin Salmon. Synopsis: Bond must stop a maniacal media baron from triggering World War III thanks to his use of technology. What we think : Solid Bond outing is upset by a overly-flamboyant villain in Jonathan Pryce, who slimes his way across the screen but seems to be a little over the top. Brosnan is excellent, Yeoh makes a terrific female foil for his stiff-upper-lip spy, and one of the late Vincent Schiavelli’s best roles last about five minutes but is eternally memorable – not so for Desperate Housewife Teri Hatcher, who sticks out like a sore thumb in this. The plot becomes nonsensical, although the enthusiasm shown by director Roger Spottiswoode overrides any feelings of niggling negativity I have about that. Action packed and thrilling, Dies is a cracker. Fox News Takes Over The World – A Parody. Following up GoldenEye was always a task in itself – the successful reboot of Bond had set the benchmark going forward, and it fell to Canadian writer/director Roger Spottiswoode to deliver the goods. While Spottiswoode wasn’t a name you’d immediately associate with top-shelf action fare, the end result of his work is – to my mind, at least – the second best of the Brosnan Bond films and one of the better modern Bonds to date. While it’s flawed somewhat, and by today’s standards technologically dated to the extreme, Tomorrow Never Dies attempted to cash in on the burgeoning issue of mass-media and conglomerate power running roughshod over Governments and world affairs. To this aspect, Dies is a success, even if that narrative arc is hidden beneath a layer of explosions and bullets – and central villain Elliot Carver’s megalomania – leaving Bond with little to do but somehow turn off the power and save the day. Reflecting on this late 90’s effort, it’s fun to watch just how different real-world tech and media performance has become from what was predicted in Tomorrow Never Dies, and although I guess you could find much to point at and snigger, there’s a kooky “alternate universe” flavoring to it nowadays that brings a smile to this reviewers face. Hi Barry, look, I’m a little busy right now, can I call you back? 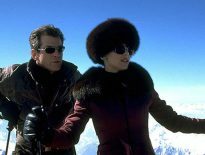 Sent to spy on a terrorist arms bazaar on the Russian border, Bond (Pierce Brosnan) uncovers the location of an America-made GPS encoder, which has fallen into the hands of a major terrorist by the name of Gupter (Ricky Jay). After managing to escape a firestorm with two nuclear missiles thanks to a feckless British Admiral, Bond is tasked with the mission to track down the encoder and return it to the Americans. The encoder, which will be used by technology and media baron Elliot Carver (Jonathan Pryce) to start a war between China and Britain, allows Carver to falsify potential military hostilities between the two countries, an tension rises when the Chinese government also sends an agent to stop Carver’s plans. This agent, Wai Lin (Michelle Yeoh), is as accomplished an agent as Bond, and the pair soon decide to put their skills together to thwart the media magnate’s masterplan. You know, in a couple of years there’ll be this thing called “bluetooth”, and you know, it’ll make everything in this movie obsolete…. Tomorrow Never Dies lives (and dies, funnily enough) on its use of technology, much of which is quite fanciful – or was at the time, in 1997 – to eyes now accustomed to smartphones and tablets with more processing power than a standard PC. Thankfully, the film never transgresses into outright lies about the power of technology, although the same couldn’t be said about the use of the media to control the world, as Carver’s oft-histrionic magnate tries to imply. While major networks like CNN and Fox would like to think they can control the public and the world like Carver’s media empire seem to be able to, in real life this just seems a tad presumptuous. 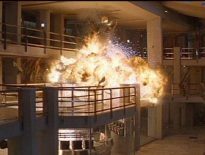 As an overall plot device, it works well enough, even if it is a bit funky in the light of modern day life; Tomorrow Never Dies seems to have that “alternative” universe feel going for it, and this is a weakness that hinders the films potential from truly being reached. In its day, though Dies was a pretty scary prospect. Hey, this Angry Birds is great!! The film’s central weakness is its central villain, Elliot Carver himself. Jonathan Pryce isn’t an actor I’d normally have an issue with (seen him in Ronin? – He’s great!) but here he’s a typically cliched Bond villain – always spouting off his masterplan to everyone and being just a little overconfident. Pryce plays the role with a hint of too much megalomania, failing to ground the character in the way modern audiences came to expect of Bond when GoldenEye performed so well. Here, we revert back to the type of villain Austin Powers parodied so well: rich, powerful and eager to gloat, but ultimately an empty shell of a character, whose motivations are not driven by any kind of reality. 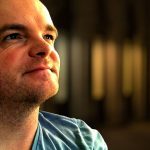 As such, the realism we witnessed in GoldenEye is subverted by generic Bond tropes, and reduces the overall credibility of the story – that being said, at face value you’d think Bond would be one of the last people sent in to stop Carver; wouldn’t you just hire a couple of hackers to crash his servers and put him out of business? Bond is too much of a blunt instrument to make a dent in the power of the media…..
Over and above this weakness, Tomorrow Never Dies is solid entertainment, and definitely up to scratch as a Bond outing. Brosnan seems more comfortable as Bond here, delivering his quips with as much tenacity as he does his stunts – and there’s a couple of doozies, including a motorcycle chase through, over, and above Saigon’s rooftops. Spottiswoode ups the ante from GoldenEye, at least in terms of sheer spectacle. The action is frenetic, although Spottiswoode avoids the use of rapid-fire inter-cutting and gratuitous editing, instead content to simply let the framing and camera angles ensure the story is best told most simply. Spottiswoode uses the scope frame well, too, and his use of lighting in key sequences is also quite cool for a Bond film – note Carver’s technologically advanced headquarters, which feels a lot like the Death Star might were it to be wi-fi capable. A final battle aboard a floating “stealth boat”, while as fantastical as anything seen in a Bond film, is full-throttle action, and a worthy entry into the Bond canon of set-pieces. Wow, you really can see my ego from here! While this is obviously Brosnan’s film, there’s a sense that Spottiswoode was aiming for a more ensemble-oriented entry into the franchise. M, played again by Judi Dench, has more to do, while the addition of Teri Hatcher (as woefully inadequate as she is here) and the eminently beautiful Michelle Yeoh (and action star in her own right), and the recurring appearances again of Samantha Bond (as Moneypenny), Desmond Llewellyn (as Bond’s gadget guru Q), and Joe Don Baker (as CIA Agent Jack Wade) ensure a continuity between this film and the last in terms of broadening the character palette. Yeoh especially holds her own as an equal of Bond, something the film doesn’t quite do justice to but manages not to really make any romantic entanglements between her and Bond too kitsch. She’s handy with a weapon, handy with her martial arts skills, and is quite easy on the eye. Hatcher, whose role here is limited to pouting, glowering and trying to be “sultry”, doesn’t quite work – she’s too big a name to appear alongside Bond without the associated baggage of her real-world actions getting in the way – and her character is thinly written at best. Yeah, I’m not a Hatcher fan, really, but that doesn’t preclude me from finding fault with both her casting and performance in Tomorrow Never Dies. Don’t argue, Asian Lady, just hold on and pray we don’t get stopped!! As a follow-up to GoldenEye, Tomorrow Never Dies succeeds in maintaining the enthusiasm for the franchise many felt had gone missing with the advent of Timothy Dalton’s grittier, harder-edged portrayal. Brosnan had made the role his own, and he definitely feels comfortable as the uber-agent tasked with saving the world. While the story was more fanciful than I’d have liked, the end result is still an entertaining, deliciously slick action adventure, featuring a couple of dynamite set-pieces that ranks as some of the best Bond action sequences (that motorcycle chase especially- find it on YouTube for a look) committed to film to that point. 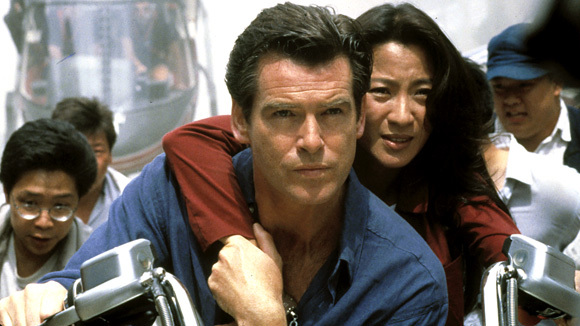 Tomorrow Never Dies is flawed, perhaps moreso than I’d have liked it to be, but is still a credible entry into a franchise that seemed to have been reborn for a new era of success. Now this one I love! I know you cite the villain as the main issue, but I think he's a big reason why I like it so much. Well, and Michelle Yeoh! Anyway, this whole production just felt like a throwback to the campy, over-the-top Bond of something like You Only Live Twice (another of my favorites) and that villain with his ridiculous STEALTH BOAT is just too much for me to not have a great time. It appeals to the B-Movie fan in me, and I've always called the Bond films "B-Movies with Budgets." Tomorrow Never Dies is the epitome of that in the modern era. You know what, Will? I agree with you a lot of your points. Bond really does stem from the pulp detective novels of years gone by, and so it follows that the Bond films have a similar, b-movie ethos. They're high fantasy, and not meant to be taken seriously (although the Daniel Craig ones have leaned more into "reality" than "fantasy" of late – not that that's a bad thing) so yes, a stealth boat and a chopper chase over the rooftops is very improbably, but at the same time awesomely cool!!! Thanks for stopping by, Will! !